In Android Lollipop during its showcase there was a feature which was shown known as the Do Not Disturb feature which was similar in function with the Do Not Disturb feature which we have seen in iOS and after the release of Android Lollipop for Nexus devices recently we have seen that it has been renamed as Interruptions maybe to make sure that it is not called as a feature taken from iOS. But the function remains the same to prevent your Phone from disturbing you with any type of notifications even Alarms can be stopped with this. And in Android Lollipop 5.0 there is a feature to help set the time period for the interruptions to be active which can be useful if you are in a meeting for like 1 hour and you don’t want any disturbance and also don’t want to loose any updates calls because your phone was turned off. There are also options to set which notifications you want to receive and which you want to be stopped like you can just let Events and reminders to be active and stop Calls, Messages etc, and another useful feature is that you can even specify any number from which you want to stop notifications like calls or messages. All you have to do is use the Volume rocker buttons on your device and here you can see that below the volume equalizer there are options for the interruptions None, Priority and All as seen in the image below. 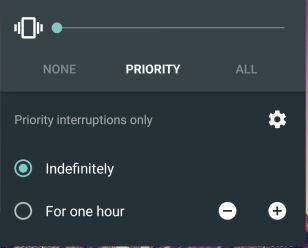 Below that you can see the time for which you want the interruptions to be active like Indefinitely which will be active until you personally turn it off. You can select a particular time frame for which you want the interruptions to be active like for 1 hours, 2 hours etc. You can see another option called Priority beside it which means that you have to select or choose and give Priority to interruptions like Events and Reminders which are alerts for any events scheduled or Alarm. Along with these you can also set Interruptions like Calls and Messages for selected contacts only by tapping on the Calls of messages tab and selecting from the options listed in the box. Interruptions can be set for particular days of the week and also for a particular amount of time, this can be done by tapping on the Days option and then selecting the day of the week and also the time should be selected which is the start time and the end time. From the list of Apps shown select and tap on the App which you want to manage. When the App page opens you can see options Block and Priority. If you activate Block then all your Notifications from the particular app will never be shown, and if you activate Priority then the notifications will be active and will be shown to you.